This distribution network called the Meridian System looks like a giant web, linking different areas of our body together. Its pathways make up a comprehensive yet complex body map that supplies vital energy to every part of the body. Philosophically, the Meridian System explains how we live, and why we become sick. “Jing luo”, the Chinese term for meridian has two interesting concepts which make up the basic structural components of the Meridian System. These concepts date back several thousand years and are reflected in the ancient Chinese medical text, Huang Di Nei Jing (The Yellow Emperor’s Classic of Internal Medicine), which says: Jing meridians act as the interior. Those which branch off horizontally are luo meridians. Jing means to pass through or pathway and refers to the vertical channels. Luo means network and refers to the networks that branch off from the vertical channels (Jing). Both Jing and Luo mean link or connection, and they are bound closely together to form channels. Although meridians work as a channel system which carries and distributes qi and blood, they are not blood vessels and have no anatomical channel structure. Many meridian research projects have been carried out over the years testing different hypotheses of how this system works. Physiological hypotheses such as nervous reflex models have been put forward, but researchers have not yet come up with a definitive model that can give a complete anatomical description of the Meridian System. When certain specific points on the skin were pierced by fine needles, feelings like soreness, numbness, heaviness and swelling would occur-a reaction known as the “needle” feeling. It was found these “needle’ feelings were always felt on a particular skin area, following a certain direction and pathway. Ancient Chinese medicine philosophers worked out the patterns of the needle points (acupuncture points) in the body, which later formed the basis of the meridian theory. In ancient times, Chinese people would experiment and stimulate different acupuncture points to get symptomatic relief from a particular ailment. As they practiced these acupuncture trials, they found points with similar effects were always distributed in an organized pattern. After classification and analysis, a meridian map was created. From every day experiences, Chinese people gradually recognized when a particular disease or organ disorder occurred, they would feel pain in a particular part of their skin, which was often associated with a rash or skin color changes. 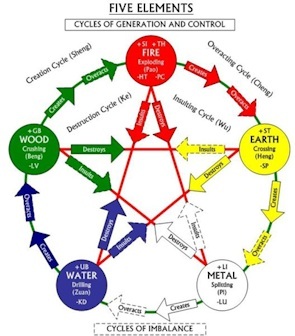 These correlations were analyzed according to the ancient philosophies such as the yin-yang and the five elements theories and further developed into an integrated scientific and artistic model for maintaining health in TCM. By connecting and uniting different parts of our body, meridians provide the transport service for the fundamental substances of qi, blood, and body fluids. The flow of qi in the Meridian System concentrates or “injects” in certain areas of the skin’s surface. These areas are very small points, otherwise known as “acupuncture points”. Although acupuncture points are located externally and superficially, they can affect the internal functions of our body. 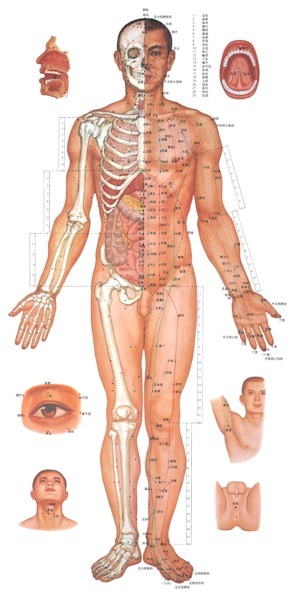 There are 365 acupuncture points, and each point belongs to a particular meridian channel that connects to specific organs. The Meridian System has 12 principal meridians that correspond to the yin and yang organs and the pericardium. (Yin organs are usually those without an empty cavity, and include the liver, heart, spleen, lungs, and kidneys. Yang organs are organs with an empty cavity such as the gall bladder, small intestine, stomach, large intestine and bladder. In TCM, yin and yang organs are physiological functional units that incorporate a much broader meaning then common western thinking.) Meridians linked with yin organs are known as yin meridians; if they are linked to yang organs, they are known as yang meridians. In addition to the12 principal meridians, there are eight extra meridians and smaller network-like luo meridians. Among the eight extra meridians, the Governing Vessel and the Conception Vessel are considered the most important channels, because they contain acupuncture points which are independent of the twelve principal meridians.